While at California State University, Long Beach, I began a research project on the lipopolysaccharide of Fusobacterium nucleatum. I have been side-tracked from this work for some time now. However, if the right student/students were to come along, I am still interested in pursuing this work. The objective of is proposal is to identify and characterize the genes involved in lipopolysaccharide (LPS) core biosynthesis in the anaerobic oral bacterium Fusobacterium nucleatum. Lipopolysaccharide is an essential virulence factor in many Gram-negative bacteria. It has been shown to be involved in processes as diverse as adhesion, internalization, immune evasion, and stimulation of the host inflammatory response. F. nucleatum and its LPS and have been implicated in the onset and progression of periodontal disease as well as subsequent bone resorption. However, relatively little is known of the genetics or precise chemical structure of this important molecule in F. nucleatum. This project will systematically examine the structure and function of the LPS core of F. nucleatum. In the process, several useful reagents will be developed that will facilitate future genetic studies of this important oral pathogen. Our work is planned so as to address the specific aims that are briefly described below. 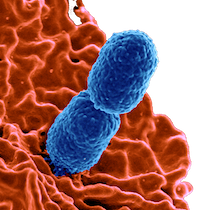 The initial stages of the proposed work will focus upon subcloning each of the putative core genes from Fusobacterium nucleatum strain 10953. The availability of genomic sequences for two F. nucleatum strains greatly facilitates this step. The transcriptional organization and regulation of these genes will be determined. Attempts will be made to over-express, purify, and characterize the enzymatic functions of these gene products. Additional experiments will be performed to assess any physical interactions between these gene products. One of the primary goals of this project is the construction of isogenic mutants for each of the putative core genes. Epitope-tagged in-frame deletions will be made to independently inactivate each gene of interest. These mutant alleles will be introduced into the counter-selectable gene replacement vector, pKO3. This plasmid will be modified as necessary to allow introduction of the mutant alleles into the bacterial chromosome via homologous recombination. Once the genotype of these constructs is confirmed, their LPS will be examined for alterations in its composition and biological function. Lipopolysaccharide core mutants have been obtained in a variety of Gram-negative bacteria. We expect that our core mutants will have phenotypes similar to those previously reported. The degree of LPS truncation will be determined by silver staining polyacrylamide gels following electrophoresis. Chemical analyses will also be performed to quantify any compositional changes in the LPS core. The possibility of unforeseen polar effects will be addressed using in trans complementation with intact, wild type alleles of each gene. The final goal of this project is to determine if alterations in LPS structure affect the biological activities associated with F. nucleatum. We will compare each of the mutants obtained with wild type strains in a series of experiments. We will specifically examine their ability to aggregate with themselves and other bacteria, resist host complement and other exogenous compounds, and colonize surfaces.